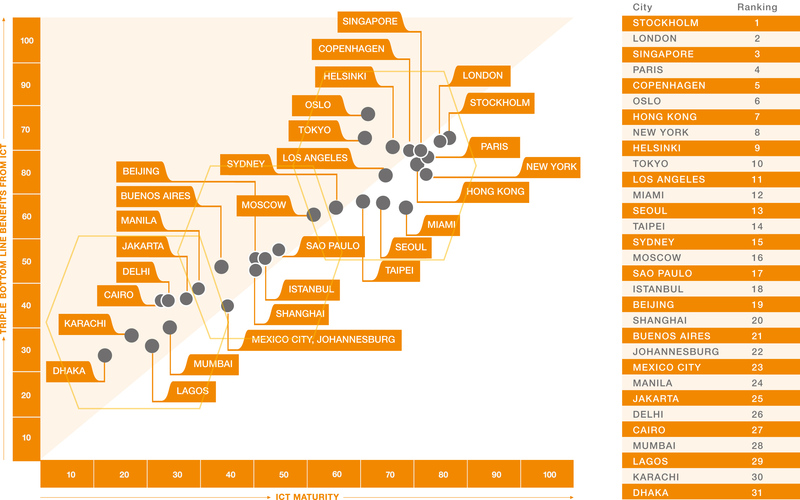 Ericsson (NASDAQ:ERIC) today published its latest Networked Society City Index. The index ranks 31 cities and measures their ICT maturity in terms of leverage from ICT investments on economic, social and environmental development; the "triple bottom line" effect. In this report, the technology aspect has been updated to include dimensions such as 4G, open data, e-transactions and more advanced usage. The results reconfirm and further strengthen the correlation between ICT and societal, economic and environmental development. The Swedish capital's top ranking is due to its well-developed ICT infrastructure, with a high penetration of smartphones and high-speed connections as well as advanced usage paired with innovation and development initiatives utilizing ICT as core enabler. Patrik Regårdh, Head of Ericsson's Networked Society Lab says: "ICT significantly speeds up interactions between various actors, making them more intense and cost-effective. The reduced cost of information exchange and transactions lowers the threshold for new enterprises and collaborations. As a result, a city's economic development becomes vitalized." ICT provides a platform for collaboration in knowledge-intense activities between companies, public sector and citizens, and stimulates specialization and dynamic information services. This enables businesses and institutions to pool resources efficiently, and to offer solutions and services that neither party could otherwise provide independently. The report cites the way Shanghai's Environmental Protection Bureau communicates daily air quality information via its website and Weibo as an example. The aim is to spread knowledge about the adverse health effect due to poor air quality among the urban population of Shanghai. Regårdh says: "ICT enables completely new ways for citizens to interact with their city and its environment. It becomes a platform for collaboration where citizens can share information and more actively engage in dealing with every day issues. The report advises that cities in emerging economies and in the early stages of ICT maturity could improve their performance by focusing on socio-economic development and incorporate a clear vision of how to leverage ICT in developing public and private sectors. Citizens' ability to use new technology and gain direct benefits needs to be at the forefront in order to drive large scale and long term output. The report also singles out collaboration between cities as increasingly important. For example harmonized open data-frameworks, rather than different systems or protocols, could accelerate for innovation. .
Regårdh explains: "An open data solution could for example allow the same public transportation information services to work not just in Miami, but in Jakarta or Mexico City. This would make life easier for tourists and travelers, but also save infrastructure costs for cities, as they could use solutions of scale." Even cities with mature economies need to take action to continue to be competitive and stay connected with future generations of technology. In addition to the top-three ranking cities, Stockholm, London and Singapore, the following cities are also part of the index: Beijing, Buenos Aires, Cairo, Copenhagen, Delhi, Dhaka, Helsinki, Hong Kong, Istanbul, Jakarta, Johannesburg, Karachi, Lagos, Los Angeles, Manila, Mexico City, Miami, Moscow, Mumbai, New York, Oslo, Paris, São Paolo, Seoul, Shanghai, Sydney, Taipei, Tokyo.